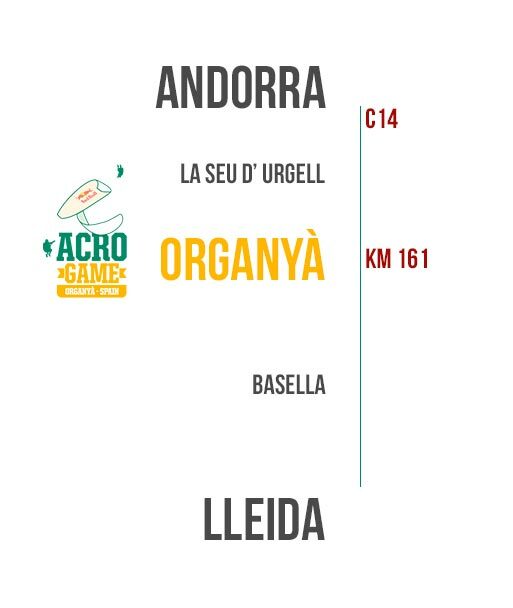 The competition will be held in the town of Organyà, municipality of the Pyrenees in Lleida province, which has become a world reference of acrobatic paragliding thanks to its optimal flying conditions, and to its surrounding mountains. You can also find beautiful trekking routes (such as the one that climbs to the Chapel of Santa Fe), MTB routes to enjoy with your mountain bike through the landscapes of the Pyrenees and also different climbing areas, some of them known at an international level. In this village the first documents in Catalan language were found: The Homilies of Organyà, which you can visit at the tourist office. At Camping Organyà you can enjoy the nature and surroundings that the pre-pyrenees of Lleida have to offer. Staying in the Camping of Organyà, 30 km away from Andorra, you will discover one of the most beautiful places of the country. Organyà an excellent spot for the Acro Game 2018. ¿Where to stay at Organyà? Staying at the Camping Organyà, 30 km away from Andorra, you will discover one of the most beautiful places of the country. Location: C/ de les Lloredes s/n, 25794 Organyà, Lleida. Cal Rafelo has two types of rural accommodation: apartments and the house Cal Culi. The two housings can be rented for one night, days, weeks or months. Hotel Dom, quiet surroundings with magnificent views, where you will have a warm welcome and a team will do everything possible to make your stay unforgettable. Location: Ctra. de Lleida, 56 – 25794 Organya.